BUFFALO, NY (WBFO) – It’s a gene-editing technology which offers promise in both medicine and agriculture but also comes with serious ethical and moral considerations. 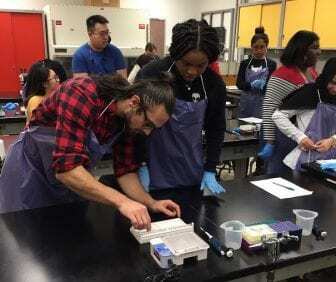 University at Buffalo students are now getting hands-on training, and taking on the ethical questions, in what is known as CRISPR. Students prepare for a laboratory lesson at the University at Buffalo School of Biological Sciences. Students have been learning about the gene-editing technology known as CRISPR and applying to modify yeast. Biological Sciences students gathered in a laboratory in Hochstetter Hall on UB’s North Campus, settled in and learned the progress of yeast cells which they were manipulating via CRISPR, which stands for Clustered Regularly Interspaced Short Palindromic Repeats. Among those taking the laboratory class is Erin Hong, a senior who plans to apply for medical school. Senior Michaela Cornaire was among those in class who, through genetic editing of yeast, sought to create pink colonies. She explained CRISPR will be relevant to many like her in their future career paths. Students have already gained an appreciation for its potential and their ability to use it. “When we looked down at our plates and got these pink colonies, we were like ‘wow, this is the future of science and we’re doing it right here,” she said. But with the technology comes ethical questions, especially following a recent claim by a Chinese scientist that he used CRISPR to genetically edit both twins, while still in the womb, to make them resistant to HIV infection. Questions remain whether the scientist actually carried out the work but Dr. Berry says it was conducted well out of ethical boundaries. “It wasn’t done under appropriate guidelines for working with human embryos. It was rushed through very fast. The technology isn’t at a stage where it should be used with humans,” he said. Identifying and discussing the ethical and societal implications of CRISPR, good and bad, is a required portion of the course. Students agree that too many unknowns remain to make CRISPR an appropriate application for human genomes. Senior Ewa Durda noted that while there are promises of medical benefits, there are also the unintended consequences. Scientists say many unanticipated negative elements could be passed down to the patient’s descendants. “We still don’t know the whole background behind editing the human genome, especially since there may be off-target sites. It might result in other mutations that might not necessarily be postitive or might not influence the person in a good way,” Durda said. Among the promises Durda and her peers pointed to were in uses for agriculture, such as strengthening crops. Dr. Berry explained how the use of CRISPR differs from other gene-editing practices applied to foods, such as Genetically Modified Organisms (GMO).